The Nebraska Horse Expo starts for me tomorrow! Although the doors don’t officially open until noon on Friday, the committee and volunteers will be at the Lancaster Event Center moving in horses, meeting our clinicians and guests and assisting vendors. I’ll be doing my time between the Nebraska Horse Trails Committee booth and the Expo t-shirt booth. But my primary job will be walking the floors from arena to arena to make sure scheduling is running as planned. I wish I had a pedometer, as I would love to know how many steps I will be taking over the next four days! I also hope to have time to watch my son ride in the Shrake youth clinics. And if I’m lucky, I’ll sneak away and ride in the flag presentation and Parade of Breeds on Saturday evening! On Sunday morning, I'll ride for Messick Tack's trail tack demo. Our riding club, The Platte River Riders, will have a booth in the non-profit area! Stop by and pick up a ride schedule. You can also order a PRR t-shirt while at Expo. It is 11 degrees right now with a “feels like” temperature of –7! It is miserable, but the rest of the week promises temperatures in the 40’s. That’s perfect expo weather! Any warmer and horse people would rather be riding! This is the coldest March that I remember for a long time. I got home late last night and didn’t plug in the truck and paid for it today! Who’d of thought you have to still be plugging in your diesel in March? 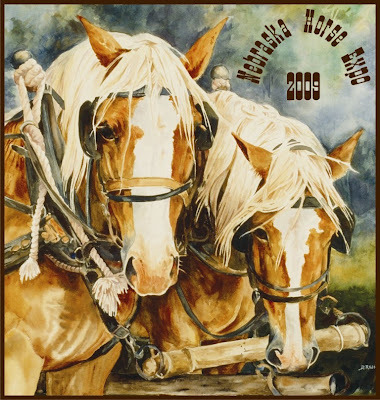 Just a reminder that the Nebraska Horse Expo will be held this Friday through Sunday, March 13 –15th. This year’s special guests are Ken McNabb, Julie Goodnight, Richard Shrake and Dianne Olds Rossi and her dancing horses! The Expo schedule is available online! Awesome, but too cold for me!!! Thanks to you and everyone on the horse council that make Expo such a wonderful weekend experience. You all put so much time,effort and love into it. It gets better and better.